The Gold Disc for successful "Es skrienu" album sales was presented to Lauris Reiniks. 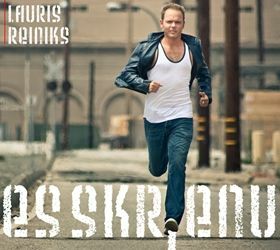 "Es skrienu" album was released in autumn of 2010 by "Microphone Records" and is now sold in 6000 copies. A rare event has happened in the Latvian music industry. The Gold Disc for successful "Es skrienu" album sales was presented to Lauris Reiniks during "Okartes skatuve- Dzimuši mūzikai" LNT reality show. According to the Latvian Music Producers Association (LAMPA) standards, a music record is certified Gold in Latvia if it has been sold in at least 5000 hard copies. "Es skrienu" album was released in autumn of 2010 by "Microphone Records" and is now sold in 6000 copies. Lauris Reiniks: "I'm twice as happy. First of all, because apparently people had the same opinion that jury members of Latvian Music awards who recognized "Es skrienu" the best pop album of the year. And that is really awesome! And second - in times like these when you can get download any music illegally and for free, there have been so many people who chose to obtain an original hard copy of "Es skrienu" album. That shows respect and trust that I truly appreciate. And it really inspires me even more. Thank you!" Elita Milgrave, Chairwoman of the Board at "Microphone Records" also announced that Gold disc status was reached already back in June, but couldn't be presented to Lauris due to his busy concert schedule and promotion of his albums for Lithuania (Aš Bėgu) and Estonia (Ma Jooksen). So the presentation of Gold disc was postponed for autumn. It had to happen now, because "Microphone Records" is now preparing new Lauris' releases in Germany and The Netherlands.